You could build a case for all of the above depending on what timeframe you were discussing. Every speaker to the microphone last week was singing a different tune and the market reflected the different notes. Speakers seeing growth instead of recession tended to push the market higher and those calling for tough times ahead greased the skids for a decline. The rise of the inflation discussions helped add speed to that decline on fears that the Fed would not cut rates again. It was a rocky week for the markets with the economic cross currents producing the waves. Friday's economic reports showed increasing weakness in some areas and increasing inflation in others. The Consumer Sentiment fell to 69.6 for February from a reading of 78.4 in January. This was the lowest reading since Feb-1992. This level of confidence is consistent with past recession levels. The expectations component fell to 59.1 from 68.1 and the present conditions component fell to 85.4 from 94.4. Inflation expectations rose to 3.7% after three months at 3.4%. 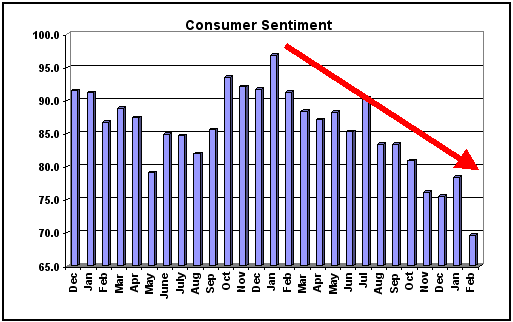 This was a bearish report since it indicates how consumers will be spending their money. 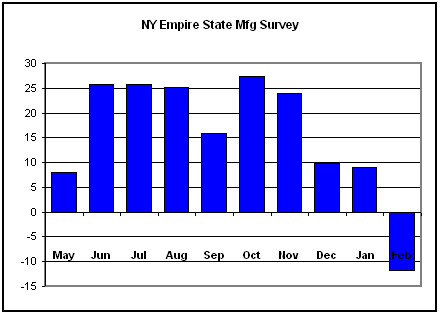 The NY Empire State Manufacturing Survey fell -21 points from 9.0 to -11.7 in February. This was a massive drop and completely out of context with the last 12 months. This is the lowest reading since May-2005. New orders dropped 12 points to -11.9 and shipments fell 20.7 points to -4.9. The only component that rose was the prices paid index which rose to 47.4 from 40.2 indicating inflation is still rising. The employment components fell with both the hours worked and number of employees declining. This was also a very bearish wakeup call. Inflation is not rising just in the U.S. according to the Import & Export price report. Import prices were up 13.7% year over year in January and the largest year over year increase since 1982. Prices from China were up 0.8% and the 9th straight monthly gain. Petroleum prices rose 5.5% for the month but non-petroleum prices are still up 3.6% for the trailing 12 months. Overall import prices rose 1.7% in January. The economic calendar for the last two weeks has been light but that is about to change. The critical reports for analysts and the Fed begin on Wednesday with the Consumer Price Index (CPI) and the Philly Fed Survey on Thursday. 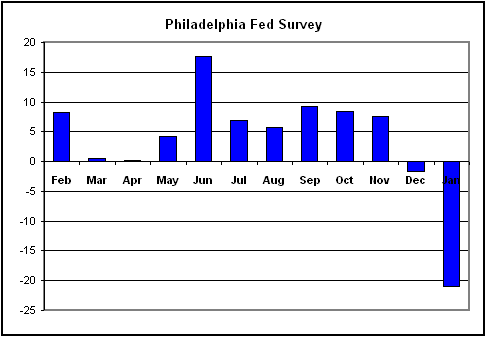 After the Empire Survey I am afraid to see what the Philly Fed Survey will bring. The consensus is for a rise from the very bearish -20.9 in January to "only" -12.0 in February. I wonder if they are still expecting a snap back in the data after the serious drop in the Empire Survey? The market is closed on Monday for President's Day and there are no economic reports. 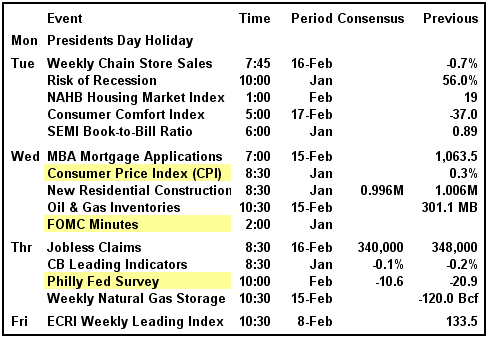 There are a couple housing reports on Tue/Wed but I doubt anyone expects a miraculous recovery. The biggest event of the week could be the FOMC minutes for the January meeting where the Fed cut 50-points with one dissenting vote. It will be interesting to see how the internal discussions impacted the decisions. Did a couple others vacillate and then cave in at the last minute or was it a unanimous front? I doubt we will actually see any bickering in the minutes but you can bet it is there if you read between the lines. The Fed meets again on March 18th and so far gentle Ben has been indicating another rate cut in his choice of phrases when he testified last week. Greenspan refuses to go quietly into the night and was on the podium again in Houston at an energy conference. He said the U.S. now has better than a 50% chance of a recession. That is up from his 33% call a few weeks ago. I guess sticking with the 33% chance is old news and he needed new headlines to sell his book. In the Business Council CEO Summit Survey last week 81% of CEOs expect "sluggish growth" in the U.S. in 2008. That is still growth and not a recession but the qualifier was for all of 2008. Q1 could recede and the rest of the year rebound. 54% of CEOs expect profits to slow but only 18% expected profits to drop. That is still pretty good news if more than half still expected profits to grow but only at a slower pace. It is a pretty good bet the banks are still going to see profits fall in Q1 given the rate they are writing down subprime assets. UBS added $13 billion in write-downs when they reported earnings last week and brought their total to $18 billion in subprime write-downs so far. Citigroup said on Friday that UBS could be forced to write off another $18 billion in 2008. UBS still has $30 billion in exposure to subprime. UBS posted a loss of $11.28 billion for the quarter and the first loss since 1997. A Bear Stearns analyst said the UBS earnings raised greater concerns that any further 2008 write-downs could be major. Fortunately these banks are writing down assets not writing them off. They will eventually see those subprime loans and CDOs recover some portion of their value. With the CDOs trading at 15 cents on the dollar today even a minor recovery to 50 cents would be a 200% rebound. 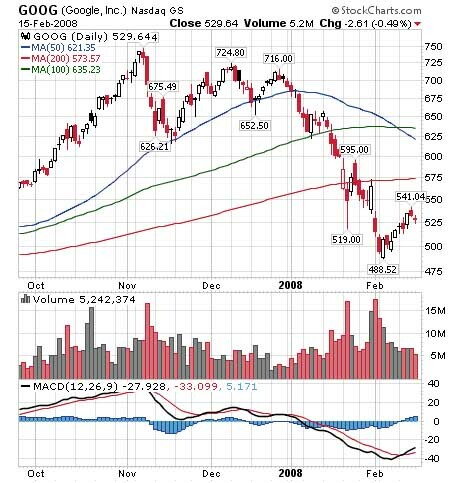 That sets the financials up to post some monster gains late in 2008 and early 2009 with comparison numbers the worst they have been in decades. It would be nearly impossible without a nuclear war for the banks to post any lower earnings in 2009. The bond insurer saga may have turned positive last week despite an attempted headline grab by Elliot Spitzer. After a week of meetings over the crisis Spitzer said a decision had to be reached within 3-5 days or the State of New York might act to breakup the companies into their component parts. He said the preferred route would be for them to recapitalize but that did not appear to be happening. "Speed is important at this point" Spitzer said and when questioned again later he added the 3-5 day window. On Friday FGIC announced they would split their company into two parts with the bond insurance portion breaking away from the toxic waste portion that guaranteed subprime CDOs. FGIC was downgraded by Moody's to A3 from AAA and said the FGIC balance sheet had materially weakened due to CDO deals. FGIC is owned by the PMI Group and three private equity firms. The top four bond insurance firms, Ambac, FGIC, SCA and MBIA collectively insure $1.7 trillion in debt with the majority of that in municipal bonds. We heard from the various meetings last week that MBI and ABK were not in danger of going under and were still able to pay their claims. Both disclosed their capital reserves of several billion each but that is not really the problem. The problem is their reserves have fallen to levels that do not support their previously fictitious AAA credit ratings. To regain that rating they would need tens of billions in new capital or to split their business models to allow the low risk bond business to be recapitalized and reviewed by the rating agencies to recover their AAA rating. I said at the beginning of this topic I thought I detected a change in the bias but so far it is just a glimmer of hope and not a groundswell of returning confidence. 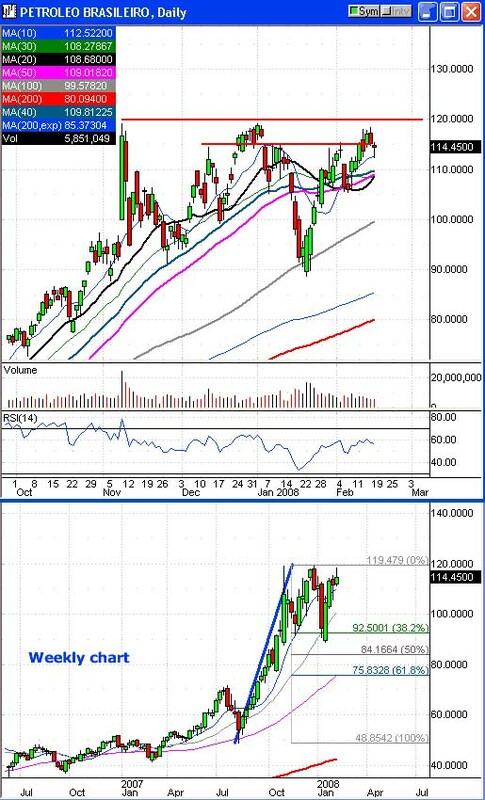 The XLF actually rose slightly on Friday despite the ugly intraday drop in the major averages. The S&P-500 closed in positive territory thanks to the gains in the financial sector. Countrywide reported on Friday that delinquency rates rose to 7.47% in January compared to 4.32% in Jan-2007. Countrywide has about $1.48 trillion in mortgages in force. Foreclosures pending rose to 1.48% in January compared to 0.77% in Jan-2007. These numbers continued to spike higher despite the massive effort underway to offer options to those in trouble. Mortgage fundings fell to $22 billion in January compared to $37 billion in Jan-2007. Mortgage loans in the process of being funded rose to $51 billion compared to $35 billion in December. Refinancing applications made up the majority of that increase. Home equity loans fell 93.6% to only $872 million from $3.6 billion a year earlier. Adjustable rate mortgages being processed fell 79.5% to $2.8 billion from $13.7 billion in Jan-2007. Could it be that borrowers have learned their lesson? Mike Parnos has produced on average $3,000 of profits during 55 out of the past 60 months. He now wants to share with you his thoughts on getting "UP TO SPEED" on basic option investing. After several weeks of gains coal stocks went from being the new green back to being black dust and unloved on Friday. Goldman kicked the sector back to the cellar with a note to investors and a lowered rating. The GS analyst lowered his rating to cautious from neutral saying the record prices and strong demand will not last as long as Wall Street currently anticipates. He said the perfect storm of winter weather and supply problems was just temporary and the market would return to balance soon. The average share price of coal producers had risen 30% since mid January and the analyst expects a 20% drop as winter eases, supplies rise and prices fall. Prices of coal stocks fell an average of 6% on the news with Peabody the least impacted at -3.6%. Best Buy (BBY) warned that fiscal 2008 profits would be lower than expected due in part to lower sales in January. BBY now expects to earn $3.05-3.10 compared to $3.10-3.20 in prior guidance. BBY expects sales of $40 billion in 2008 and same store sales growth of 2.5-3.0%. Previously they had expected 4.0%. A BBY customer sued them for $54 million because they failed to protect her laptop when it was in the store for repairs. The laptop was returned for service in May and BBY kept her giving her the runaround about when it would be fixed until they finally admitted on August 9th it had been stolen sometime before May-25th. During that period she could have taken steps to protect herself from identity theft if she had known it was stolen. BBY offered her $2500 if she would agree not to disclose the problem and she refused and took her complaint to court to try and force BBY to change their practices. Wal-Mart (WMT) reports earnings on Tuesday and analysts are mixed over what to expect. WMT cut prices to the bone in December and the ploy worked with same store sales rising 2.7%. Conditions worsened in January when shoppers redeemed gift cards for necessities and low margin food when they redeemed the cards. Sales rose only 0.5% when analysts were expecting 2.0%. After the bell on Friday WMT announced it was going to support only the Blu-Ray DVD format and phase out any HD-DVD offerings. WMT joined Netflix and Best Buy, which made that same decision earlier in the week. Looks like it is lights out for HD-DVD and higher prices ahead for Blu-Ray now that the competition is over. Both Wal-Mart and Best Buy are going to see a great second quarter boost. The stimulus package checks are going to be mailed in May and they are already being called the "free TV check." Those two stores will benefit the most from the free money. Those struggling to get by will rush to Wal-Mart to buy necessities and those higher up the food chain will see it as a chance to upgrade their electronics to either a new flat screen TV, Blu-Ray DVD, Xbox, or Sony PlayStation. It is conceivable $50 billion of the payout will end up in the registers of BBY/WMT. Also on the earnings schedule for Tuesday are HPQ and CROX. Hewlett Packard (HPQ) is expected to report 81-cents for Q4 with revenue of $27.6 billion. Sales of computers were strong going into Q4 but skidded to a halt as the subprime worries put companies on the defensive and froze budgets. However, HPQ does 70% of its business outside the U.S. and may not have been impacted as much as some analysts believe. Goldman Sachs said no tech company is immune from the slowdown but with the greatest geographic diversity and currency exchange benefits HPQ could have greater earnings resiliency. One analyst is calling the earnings report for CROX as the most important in their history. CROX is still oversold and heavily shorted but support is holding at $32. The market is still pricing in a continuation of their problems in the Q3 report of excess inventory and slower sales. The massive sell off has knocked them back to a PE of 12 times earnings and that is very bullish if sales are even minimally decent. The odds are very good there will be a monster move after the event but it is tough to tell in advance which story to believe. Straddle anyone? I am sure CROX holders are hoping for a PriceLine event next week. PriceLine (PCLN) spiked $21 on Friday after reporting earnings of 96-cents when analysts were expecting only 84-cents. They also raised guidance by about 10-cents for Q1 and 20-cents for the year thanks to a strong 62% jump in bookings. Goldman Sachs raised their target to $140 from $130 and said the global expansion was insulating them from consumer weakness in the USA. Oil prices continued to rise to close at $95.69 on Friday and traders are talking about $100 once again. The Venezuela crude cut and OPEC sound bites are reportedly putting a floor under prices. In reality I think it is due more to expiring futures next Wednesday and short covering that is pushing prices higher. This is typically a month where crude prices fall as winter demand begins to ease. Cold winter weather, production cuts for various reasons around the world and the Venezuelan embargo of Exxon caused those shorts to run for cover with only a couple days left on the contract. Rewind to January 21st and our last 3-day weekend. SocGen began dumping $73 billion in futures on the Monday after option expiration with the U.S. markets closed. A monster sell off in the global markets carried over into the U.S. markets when they reopened on Tuesday. Fast-forward to February 18th and the U.S. markets are closed for 3-days once again. While nobody expects the SocGen implosion or something like it to happen again there is no doubt that traders still licking painful wounds from the January event were lightening up on stocks on Friday morning. There were also the option expiration pressures. 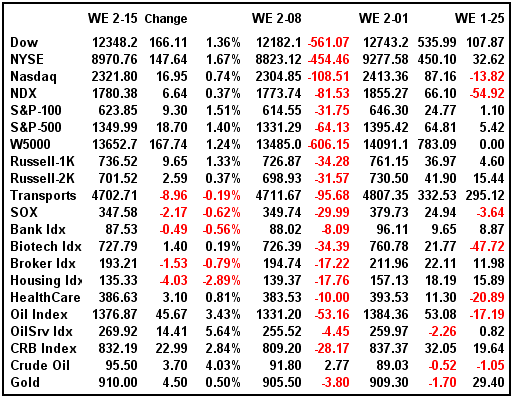 With the markets trading mostly sideways for the last three weeks there were a lot of options expiring close to where they were written. I scanned a lot of stocks this weekend and quite a few were pinned almost exactly to a strike price with minimal volatility over the last couple days. It appeared market makers and traders were simply content to let February expire calmly and without a lot of drama in the form of volatility. I think the markets did remarkably well on Friday given the horrible recession/inflation data, option expiration and the 3-day weekend. After nearly a 100-point intraday drop the Dow recovered to end down only 28 points and right in the middle of its recent range. No harm, no foul and this was a killer week in the way of news events and high profile speeches. The Fed still appears to be willing to cut rates although reports over the next two weeks could dull that hope. Almost everyone agrees Q1 could be the bottom for earnings and with the Fed's aggressive posture this recession or soft patch should be short and nearly painless relatively speaking. This does not mean the market is about to explode higher and there is still the chance of a retest of the lows. However, with each passing day the chance of that retest dwindles. 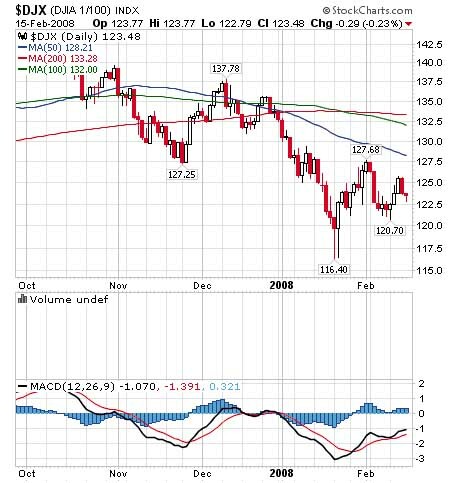 If the bond problem appears to be finding a solution then the market bottom is behind us. The key there will be the solution. Friday was also the last day hedge fund investors could request a withdrawal of their funds at the end of March. There is a 45-day notice period ahead of the quarter end and that period began this weekend. If your withdrawal request was not filed by Friday you are out of luck until the end of June. Since the various funds are probably doing better than the individual investor in the current market they were probably able to prevent a mass exodus. Of course any notices received don't need to be acted on for a few more weeks. They have to plan for the withdrawal but not necessarily race for the exits next week. 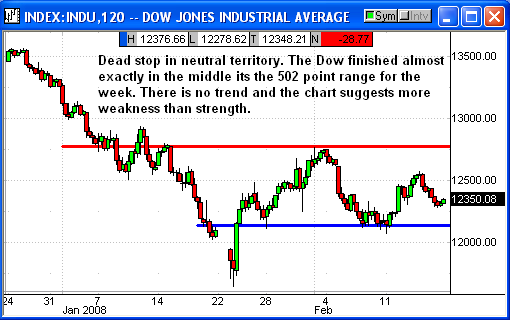 The Dow traded in a 502-point range for the week (12070-12572) and closed almost in the center of that range at 12350. There is nothing to be determined from this range bound trading except that 12275 appeared as light support on Friday. If traders clearing up some option positions and lightening the load before the weekend were the cause of the minor loss then next week could see us retest the upper end of the range. That assumes there is no meltdown around the world on Monday. Personally I was not impressed by trader conviction this week. Only one day managed to break 7 billion in volume and the new 52-week lows are starting to climb to 3-week highs. Volume for an option expiration week was extremely light and I think it was because nobody knows where the market is going. Everybody is waiting on the sidelines for a direction to appear. Volume in the high 6-billion range is very anemic for any directional view. It shows an extreme lack of conviction by both bulls and bears. Tech stocks faired a little worse on the width of their range but still managed to close right in the middle of that range. 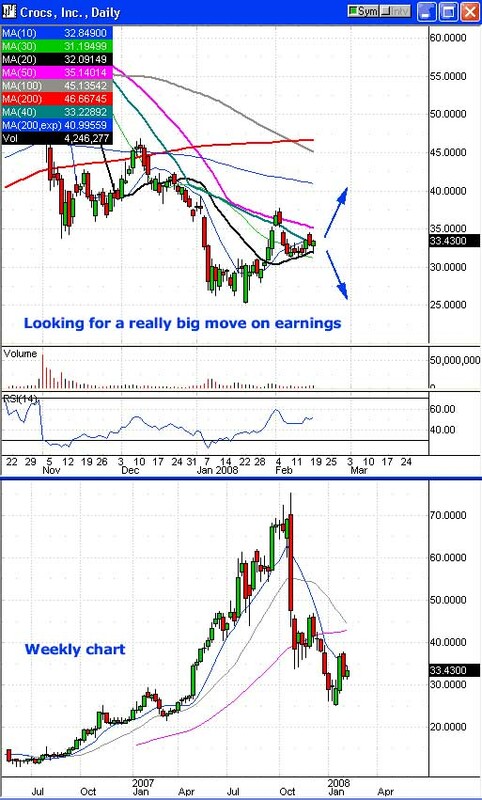 Hewlett-Packard will be the key for techs next week. Their earnings on Tuesday will be the event that will provide traders with some comfort or smack them right between the eyes if HPQ misses badly. 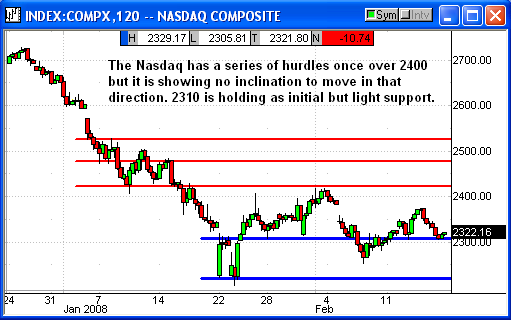 Nasdaq 2310 continues to be support and 2375 resistance as we await that earnings report. The S&P closed nearer the upper end of its range than the Dow/Nasdaq. I believe this was due to the buying in the financial stocks. With financials accounting for 21% of the S&P any gains there are bullish for the index. Initial support at 1340 with stronger support at 1320. 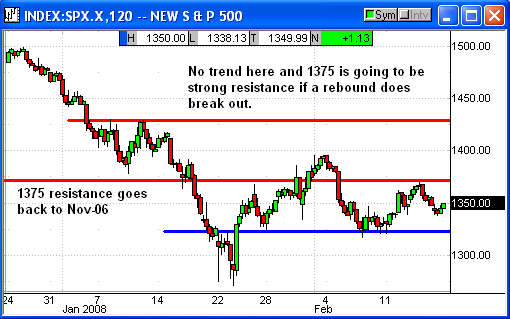 Initial resistance at 1365. 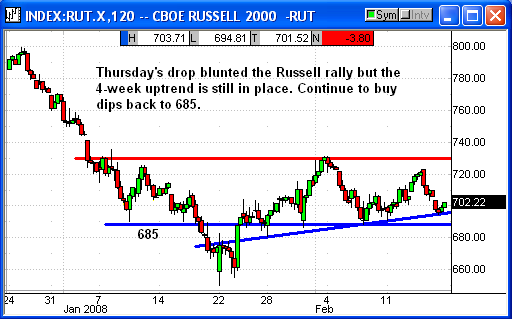 The most bullish index was still the Russell-2000 with a decent 4-week higher low trend still in place. The high for the week on Thursday at 721 was above the same relative resistance of the other indexes. Until this uptrend fails I would continue to be mildly bullish. I emphasize "mildly" because the Russell uptrend is only slightly bullish and definitely not a screaming buy. I would continue to watch it as our market sentiment indicator and buy the dips back to 685. The biggest problem facing the markets over the next couple weeks could be rising fears over the return of stagflation. That is rapidly rising inflation and very low economic growth. The Fed becomes trapped between their desire to combat the low growth but can't continue to act aggressively because of rapidly rising inflation. The reports we saw last week definitely showed signs of this condition. The last time we really had serious stagflation was the late 1970s when growth slowed to a crawl and interest rates spiked to 18%-19% and homebuyers disappeared. If inflation in the CPI report next week continues to spike higher we could be looking at another Fed disaster in the making. The market would not look positively at rapidly rising inflation in those critical reports over the next two weeks. Play Editor's Note: We have a lot of stocks on our watch list. A few bullish candidates are: STLD, RIG, HES, and OII. Plus, TYC looks like a strangle candidate right here near $40.00. We noticed a lot of bullish candidates in the oil services sector. 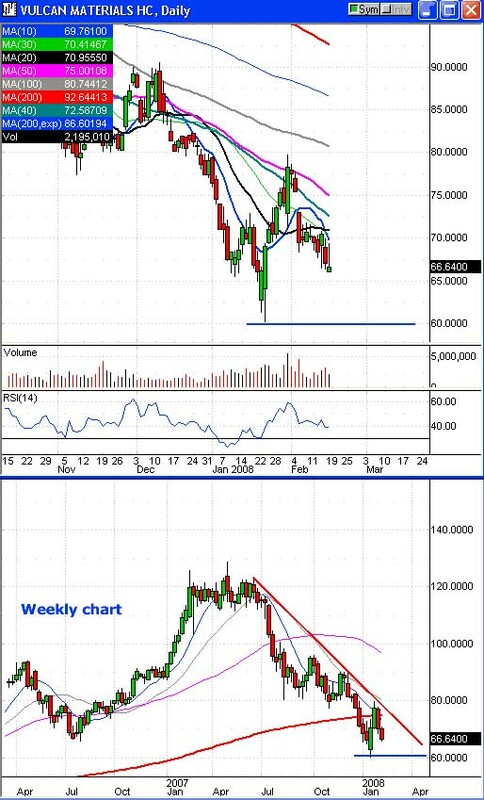 Our biggest concern with the group is that crude oil looks like it might be short-term overbought and poised to move lower, especially as the current contract expires this coming week. However, it doesn't matter if oil is at $95 or $90 it is still record high prices and that is good for business with the service stocks. Our challenge as traders is that the service stocks could still go down if the oil sector retreats on a crude oil pullback. We will try and use a conservative (tight) stop at $87.45 to limit our risk. More conservative traders could also wait for a rally over $92.00 before initiating positions. Our target is the $99.00-100.00 zone. FYI: ATW has a moderate amount of short interest, about 7.4% of the 27.6 million-share float. That is about 4 days worth of short interest. We are suggesting the March or April calls. Remember, it is up to the individual trader to decide which month and which strike price best suits your trading style and risk. We have most of the major companies in the fertilizer industry on our play list as bullish candidates but it seems we had forgotten one - CF. Shares of CF out performed its peers on Friday with a 2.2% gain. Volume was a little light but if you own the stock you probably not complaining. Shares are nearing significant resistance at the $120 mark. We are suggesting readers use a trigger at $121.01 to catch the next leg higher. If triggered at $121.01 our target is the $138.00-140.00 zone. The Point & Figure chart is bullish with a $141 target. FYI: The most recent data puts short interest at 6.8% of the 53.4 million-share float. That is only 1.8 days worth of short interest but a breakout higher could certainly spark some short covering. Plus, CF is due to present at the basic materials conference on Feb. 20th. Note: We have multiple stocks in the same industry listed as bullish candidates. We are suggesting that you do not play all of them. If the group starts to turn lower then most likely they will all turn lower. Limit your exposure. Our suggested trigger is $121.01. If triggered we would use the March or April calls. Many of the steel stocks look attractive as bullish candidates. NUE still has some overhead resistance near $62.50 and $65.00 but the stock has broken its bearish trendline of lower highs (see chart). We are suggesting call positions now but readers could wait for another dip back towards $60.00. Our target is the $68.00-70.00 zone since the $70.00 level is likely to be significant resistance. The P&F chart is bullish with a $76 target. We are suggesting the March or April calls. SII is another oil services play. Please read our comments in the ATW play tonight regarding our concerns for oil and the oil sector and our risk with the oil service stocks. 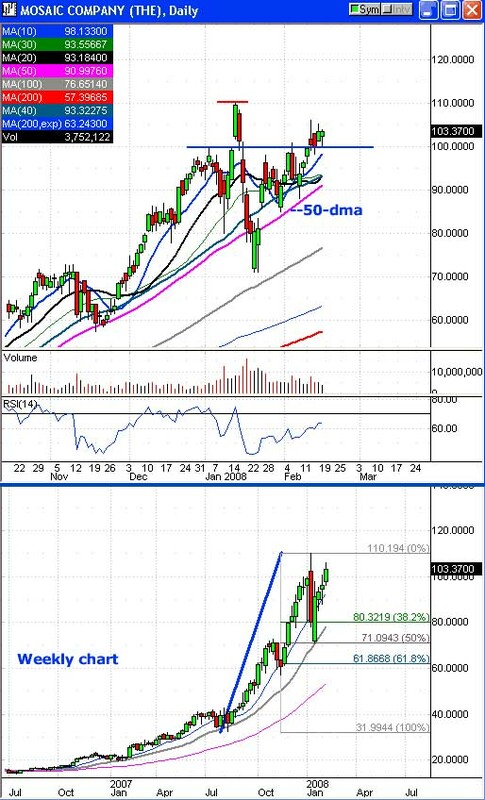 We are suggesting calls in SII here at current levels near $60.00. Our short-term target is the $64.25-65.00 range. The $65.00 level is probably short-term resistance and the descending 50-dma might give us trouble (currently 65.15). The P&F chart for SII is very bullish with a $77 target. If you haven't heard Microsoft (MSFT) has made a hostile bid to buy Yahoo! (YHOO) for about $31 a share. The stock is trading under $31.00 a share for a couple of reasons. First is that there are those on Wall Street who think the deal won't get past an anti-trust review. Second, there could be significant hurdles to actually merging the two companies with so much duplication. Third, there are a lot of Yahoo employees that strongly dislike MSFT and will do anything to not sell (or work) for MSFT. CEO and co-founder Jerry Yang is one such person and he is desperately seeking an alternative to MSFT's hostile bid. Other members of YHOO's board are worried that he may not be holding up his fiduciary responsibility to shareholders. So why are we suggesting calls on YHOO? Because odds are still greater that MSFT will make a higher bid for the company. Many are speculating that it will be in the $33-34-35 range. We considered making this a covered call play where we buy YHOO and sell the $30 or $32.50 calls since this ordeal could take months. However, if and when MSFT does raise its bid it will surely seal YHOO's fate and the stock should react positively. Obviously, this play is not without risk. MSFT could walk away or YHOO could do something silly that would poison the deal (and probably launch a hundred different shareholder lawsuits). If something occurs and it looks like a MSFT-YHOO merger doesn't happen then the stock and these options will evaporate faster than we can click our mouse button. We're electing to not use a stop loss. This is truly a speculative play. You could choose the March, April, or July options but we suspect any new bid will occur in the next 30 days so we're using the March calls. Take your pick. While DVN deals in both oil and gas we see it more as a natural gas play. The stock has rallied right to resistance near $95.00. At the same time both crude oil and natural gas look short-term overbought and due for a correction. Thus this looks like a decent spot to buy some puts on DVN with a stop just above resistance. We are suggesting puts now or on another failed rally near $95.00. Our target is the $87.50-87.00 zone. We are suggesting the March puts. As a major provider of construction materials VMC is probably suffering due to the housing slump in the U.S. The most recent earnings report (last week) didn't seem that bad but the stock sold off anyway. The trend is lower. Shares just produced a failed rally near $70.00. This looks like a spot to capture a drop back toward the January lows. Our target is the $60.50-60.00 zone. The stop loss is a little bit wider than we would like but VMC can see some big $3-$4 swings intraday so readers should consider this an aggressive, higher-risk play. There are a lot of expectations riding on CROX's earnings report due out Tuesday, after the closing bell. Wall Street estimates are for a profit of $0.44 a share. We suspect that the stock will see a huge move on the report. Only problem is we don't know which direction so we're suggesting a strangle. 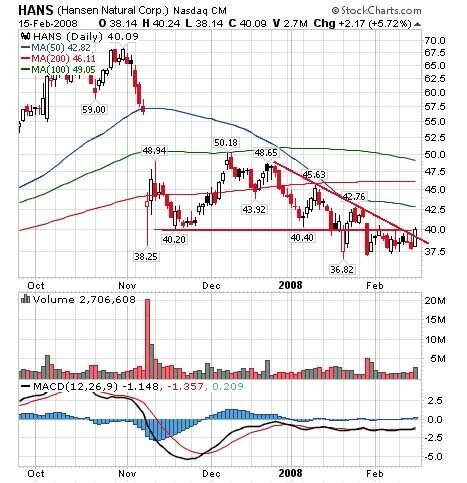 We looked at buying the March $30 puts and the March $36 calls but it would cost more than $5.00 thus CROX would have to move $7 or $8 and we might breakeven. We picked wider options but that makes it more risky as well. Part of the risk is that $40 looks like overhead resistance and $25 is support so CROX could just bounce around this area and our strangle would eventually wither and die. A strangle involves buying both an out of the money call and an out of the money put. Our estimated cost on this strangle is $2.50. We want to sell if either option hits $4.25 or higher. The oversold bounce in AAPL is struggling and shares never confidently broke through short-term technical resistance at the 10-dma. Lack of conviction on the rebound is worrisome if you're bullish. 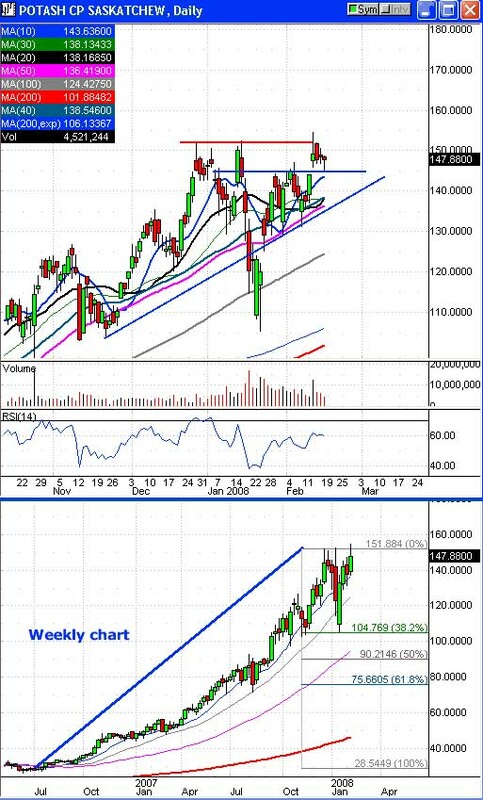 Should the market show any weakness this week then we would expect AAPL to retest the $120 level as support. 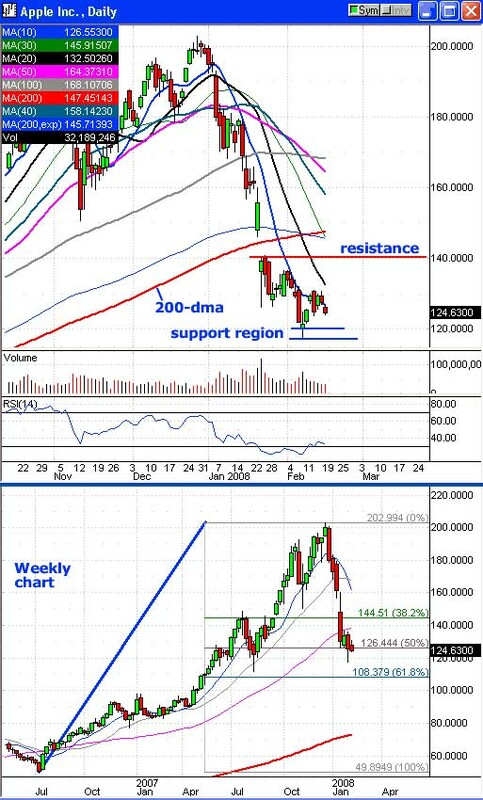 This could be a painful week for call holders if AAPL pulls back to $120 but a bounce near $120 would be another tempting entry point to launch new bullish positions. 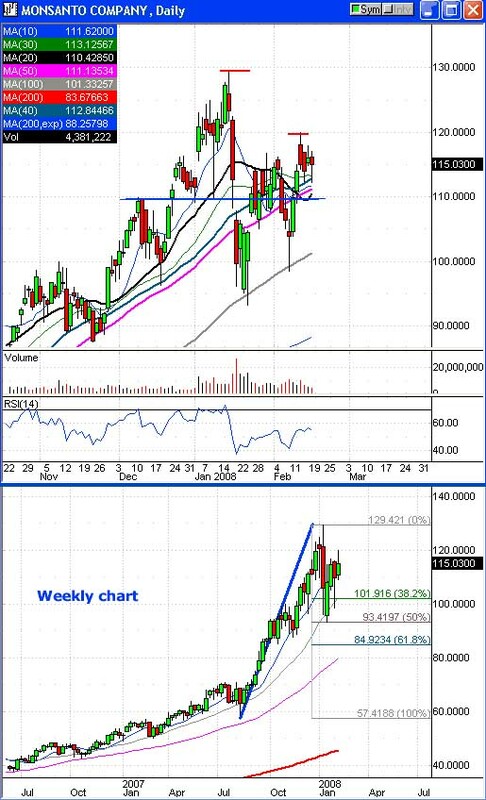 We are suggesting a stop loss at 116.99 under last week's low. More conservative traders may want to use a stop closer to $120. Our target is the $139.00-145.00 range. We would use another bounce near $120 as an opportunity to launch new credit put spreads. The options we suggested were buying the March $110 put and selling the March $120 put. Again, look for a bounce before launching new naked put positions. We had suggested selling the March $150 put with plans to buy it back when AAPL hits $139.00. Shares of MOS held up pretty well on Friday. Overall the stock tested broken resistance near $100 as new support multiple times this past week. Traders were buying the dip on Friday afternoon and if the market had been open longer MOS would have closed in the green. We remain bullish and would still consider new positions here. However, we have a terrible stop loss. The stock is so volatile that we're trying to give it 10% room to move. Currently our stop is more than 10% away but the $90 level and its 50-dma is the only clear form of support. 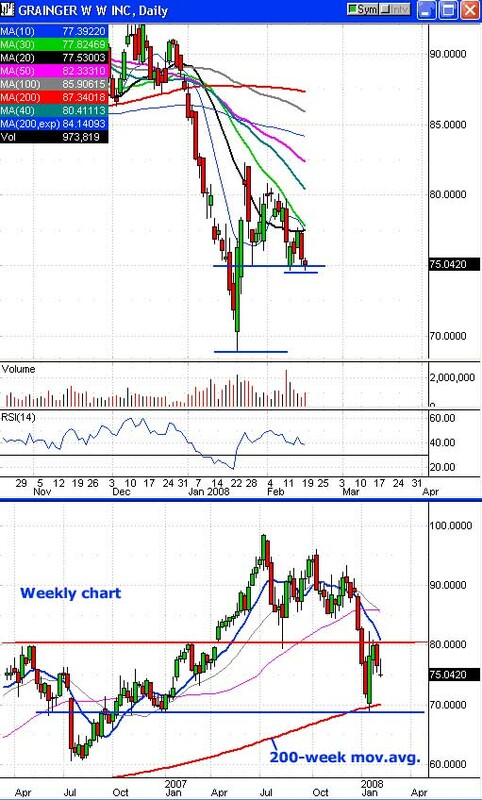 More conservative traders will want to strongly consider raising their stop loss near $95.00, which might be short-term support if $100 breaks down. We have two targets. The first target is $109.75, just under the January highs. Our second, more aggressive target is the $118.00-120 zone. These are very volatile stocks with a lot of intraday spikes. We would consider this a more aggressive, higher-risk play. Oil stocks performed okay this past week and both the OIX oil index and OSX oil services index look poised to move higher. 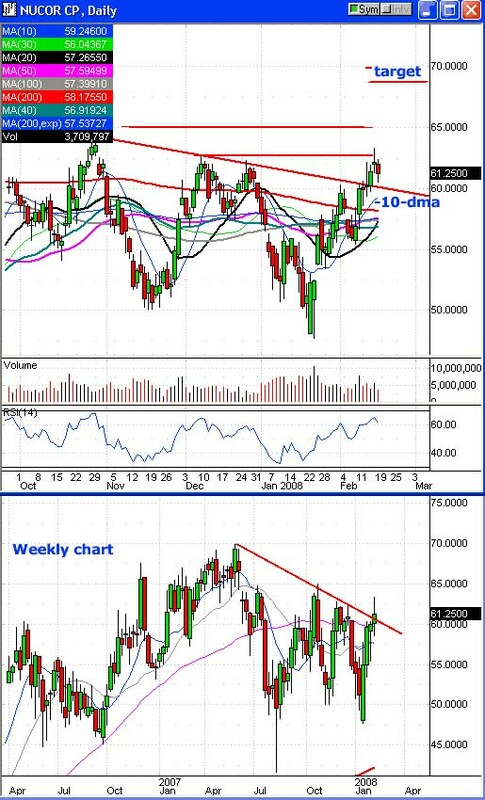 One item that could impede the energy sector's rally this coming week is crude oil. 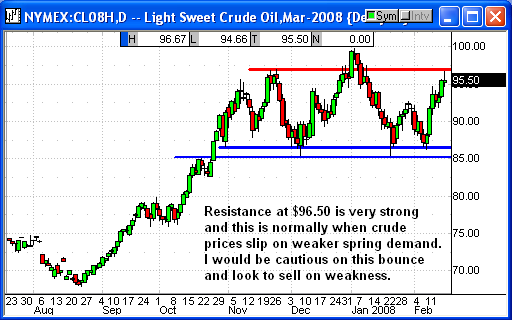 The rally in crude looks like it's short-term overbought and crude is testing resistance. Honestly, if you look at crude oil you can see what looks like the tip of a right shoulder in a bearish head-and-shoulders pattern. If oil moves down from here traders will need to turn more defensive on oil plays, although oil service stocks could still do okay. Shares of PBR slipped on Friday but investors bought the dip at its 10-dma. We suggested a rebound in the $112.50-110.00 zone was a new entry point and that is what PBR provided. 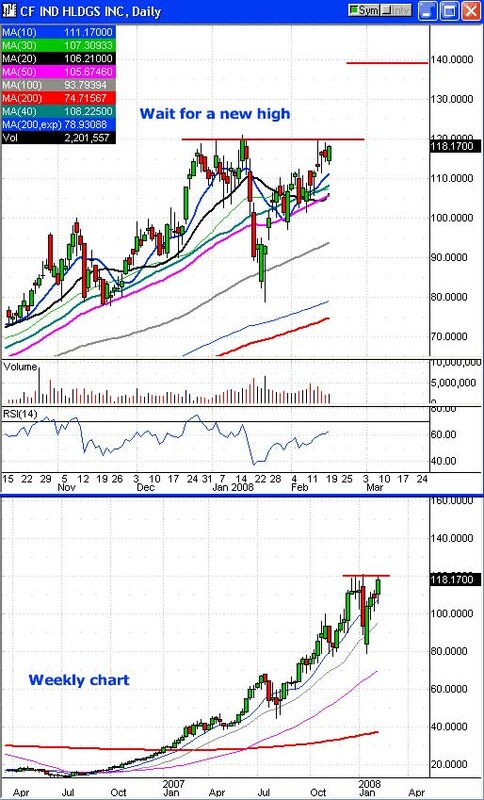 We are leaving our stop loss at $104.95 for now but more conservative traders will want to strongly consider a tighter stop near $110 instead. Speaking of conservative traders, the $120 level is another zone of resistance and you might want to wait for a new high over $120 before initiating new plays. We are considering a second target near $140. Currently, our target is the $128.00-130.00 range. The move over $116 has produced a new Point & Figure chart buy signal. Actually it is a quadruple-top bullish breakout buy signal with a $138 target. FYI: Another risk is PBR's earnings report. We can't find an earnings date and they normally report in mid February. That is a risk because we do not like to hold over an earnings report. POT is still relatively close to its recent all-time high and traders bought the dip on Friday near $145. Shares look poised to breakout into a new leg higher but the bears would argue that POT is struggling to make it past resistance in the $150-153 zone. We would suggest a bounce over $150 or a dip and rebound in the $140-143 region as potential entry points for new call plays. We have two targets for POT. Our first target is the $158.00-160.00 range. Our second, more aggressive target is the $168.00-170.00 zone. More aggressive traders may want to aim significantly higher. The Point & Figure chart is forecasting a $222 target. Again, this is a very volatile stock. Readers should consider it an aggressive, higher-risk trade. 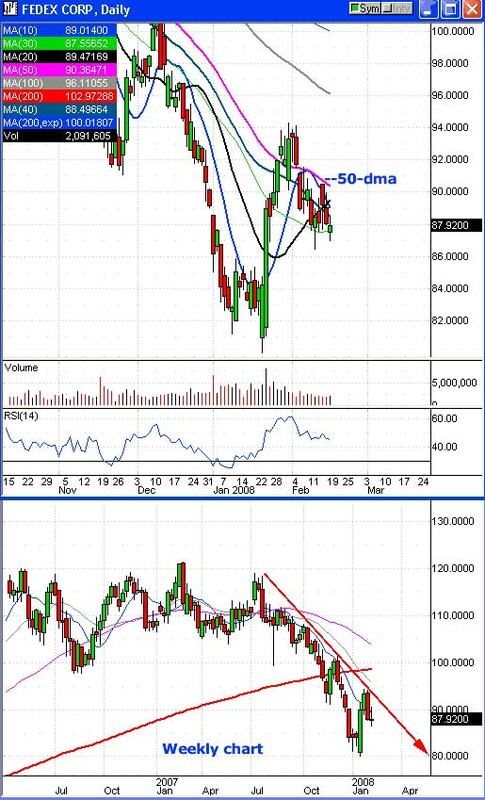 Aggressive traders could put their stop under the 50-dma. There is still a lot of fear and uncertainty in the market about how, if any, bailout plan for the bond insurers will work, or how fast it can happen. Investor worries about another round of massive bank write downs are growing again (did they ever go away?). The big news for the bond insurers on Friday was news that FGIC is asking to be split into two companies to separate their municipal bond business from the rest of its bond insurance business. The market immediately wondered if ABK and MBI would do the same. ABK's management said they would look at it but really didn't suggest one way or the other. Shares of ABK lost 3.89% which doesn't illustrate a lot of hope for the company. We remain bearish, although Jim did comment on a glimmer of hope in his wrap tonight. Currently we are suggesting the May puts and a speculative out of the money March call as a hedge to protect us if a bailout deal does get done. Many on Wall Street expect something to occur this week but it could drag out to next week. The options we suggested were the May $5 or $2.50 puts and the March $20 call. We are not convinced. Shares of BSC surged 5.5% on rumors that it was being acquired by China's CITIC Securities. It appears now that this was some option expiration shenanigan to juice the stock higher before February's equity options expired. BSC has been labeled a takeover candidate for months due to the long-term decline in the share price. More conservative traders may want to go ahead and exit early now to limit their losses. We're actually going to nudge our stop loss higher to $85.05 just to make sure we don't get stopped on a minor intraday spike on Monday. Look for a new decline under $80.00 as a new entry point for puts. 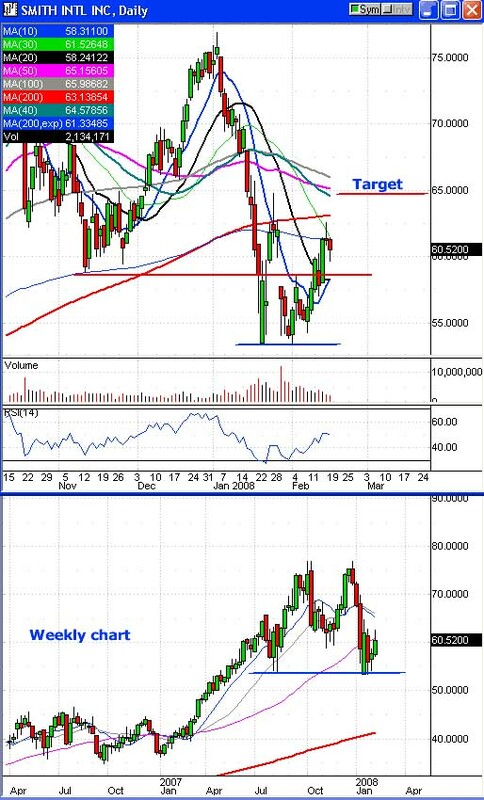 Our target is the $71.00-70.00 zone. Our biggest risk is that a bailout plan for the bond insurers does get done (and probably this coming week). If plan is announced and the street thinks it has a good chance of actually coming to pass then shares of BSC are bound to rally sharply due to its exposure to the sub-prime mess. 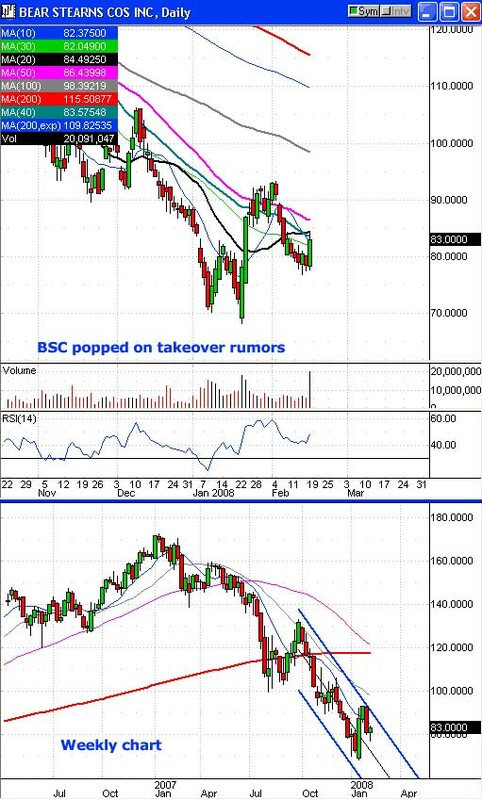 If BSC provides a new entry point we would suggest the March or April puts. Nothing has changed for FDX. The transports are still facing higher fueled costs. FDX is also facing the possibility of a U.S. recession. The trend continues to look bearish. 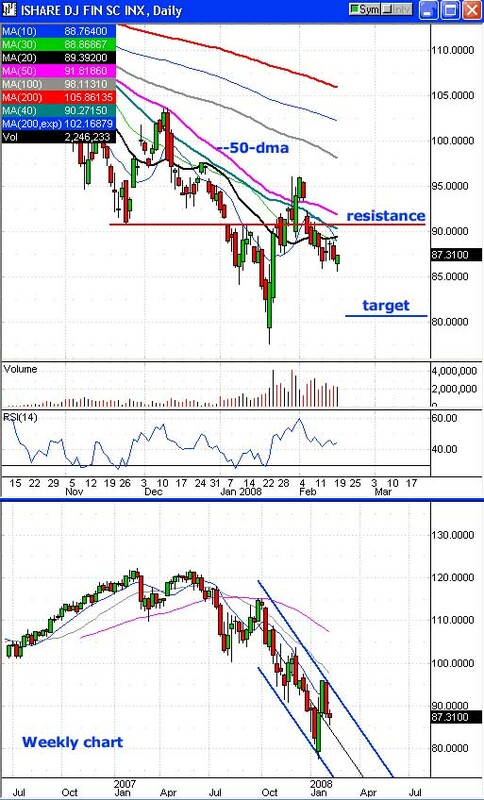 Technical resistance at the 50-dma held last week so we're adjusting our stop loss to 90.55, which is relatively conservative given FDX's share price. This looks like another bearish entry point to buy puts. 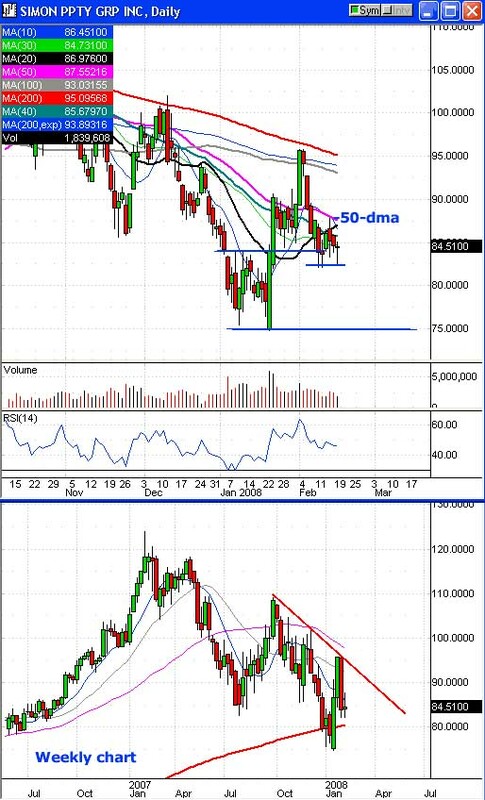 There is potential support at $86 but our target is the $81.00-80.00 zone. We are suggesting the March or April puts. GWW continues to drift lower but the stock settled on the $75.00 strike price as February options expired. We remain bearish and if you are looking for a new entry point watch for a failed rally under $78.00 or a new relative low under $74.60. Our target is the $70.75-70.00 zone. Hmm... the trend in the financials is still bearish. Yet the sector managed a bounce on Friday in the face of growing write down fears. This could be a warning sign for the bears. Wait for another failed rally in the $88-90 zone or a new low under $85.50 before considering new put positions. We're adjusting our stop loss to $91.85, which is just above the 50-dma. More conservative traders will want to strongly consider adjusting their stop closer to $90.00. We're aiming for a test of the $80.00 region. Our official target is the $81.00-80.00 zone. FYI: Read tonight's wrap. Jim discusses the bond insurers again. A solution in that industry could light a fire under the financials. The banks are already setting up for a strong third and fourth quarter. The question is how bad will the first two quarters of 2008 be? We would consider the March or April puts. For comments on the bond insurers see ABK's update and tonight's market wrap. 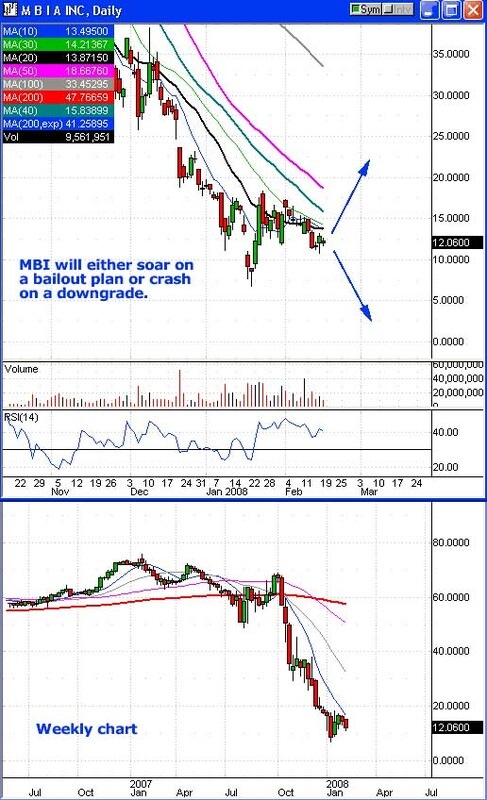 MBI's 3% decline on Friday is not encouraging if you're bullish. We remain bearish. Currently we are suggesting the May puts and a speculative out of the money March call as a hedge to protect us if a bailout deal does get done. Many on Wall Street expect something to occur this week but it could drag out to next week. The options we suggested were the May $7.50, $5.00 or $2.50 puts. We recently added a deep out of the money call, the March $22.50 call, as a hedge in case a rescue plan does get announced and the stocks react to it. MHK reported earnings Wednesday night and beat estimates but then warned for the future. The company continues to struggle due to the housing slow down. The trading action Thursday was bearish. We're suggesting puts now with MHK under $75.00. 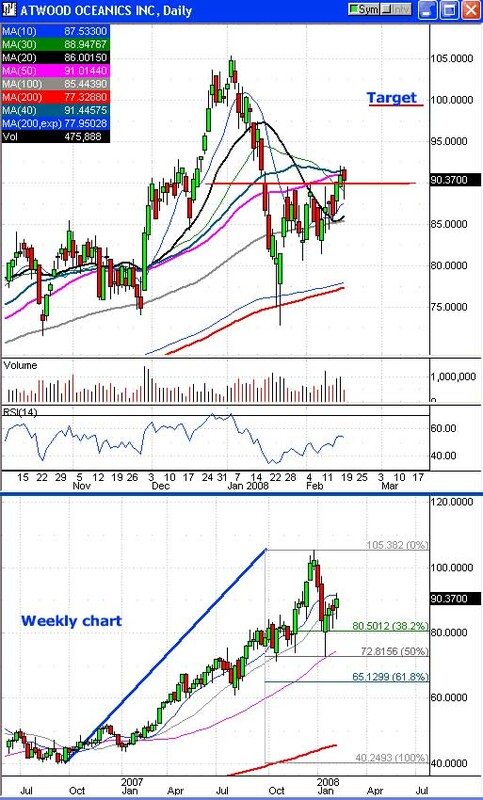 We'll try and get buy with a stop loss above Thursday's high at $78.05. 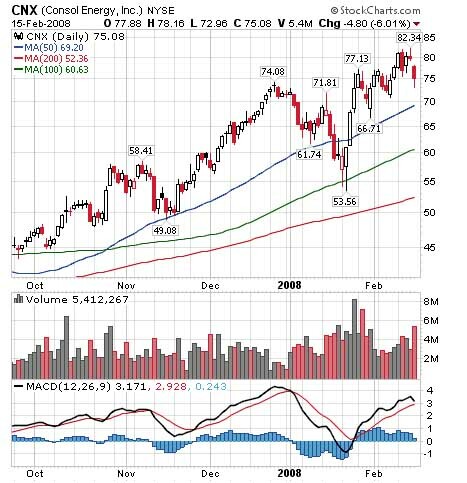 There is potential support at $70.00 but we're aiming for the $66.50-65.00 zone near its January 2008 bottom. A failed rally near $75.00 would be a very attractive entry point. 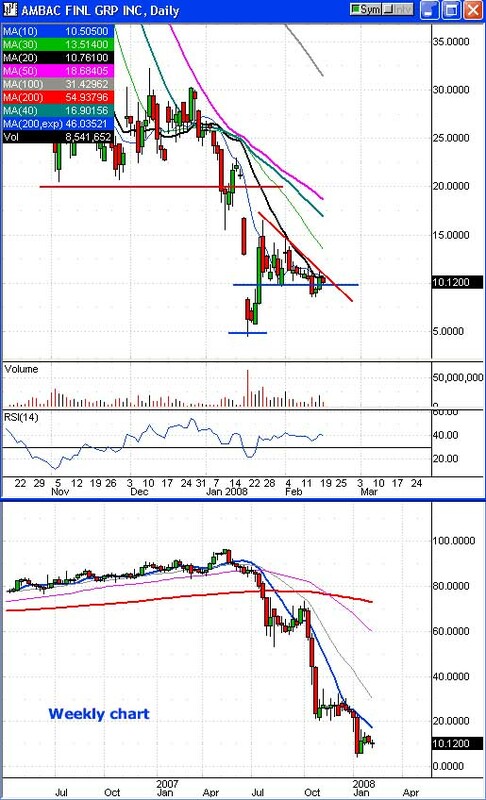 Shares of MYGN continued to slip lower and the stock broke down under short-term support near $38.00 on Friday. Volume has been just a little above average all week, which is probably negative since the trend is down. MYGN under performed the DRG drug index and BTK biotech index. We would keep an eye on the BTK, which looks ready to bounce higher next week. Please note that we're adjusting the stop loss to $40.51. Our MYGN target is the $36.00-35.00 range. More aggressive traders may want to aim lower. The Point & Figure chart is bearish with a $34 target. FYI: We always consider a biotech stocks to be a more aggressive, higher risk play because you never know when an FDA decision will be released or some clinical trial info will come out that could send the stock moving sharply either direction. We're not suggesting new positions at this time but a failed rally under its 10-dma could be a new entry point. SHLD managed a minor bounce in the $96-97 zone but the stock continues to have a short-term and long-term bearish trend of lower highs. We remain bearish but we're waiting for a more convincing breakdown. Currently our official entry point to buy puts is at $94.75. If triggered at $94.75 our target is the $86.00-85.00 range. We do not want to hold over the end of February (now confirmed) earnings report. 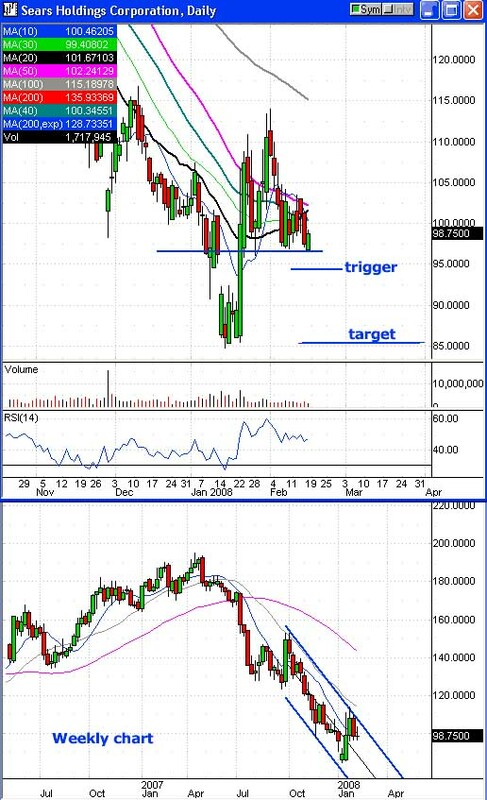 If SHLD hits our trigger at $94.75 we are suggesting the March or April puts. Like most of the market the REIT stocks spent the week churning sideways. However, the overall trend continues to look bearish. We are adjusting our stop loss to $90.15. 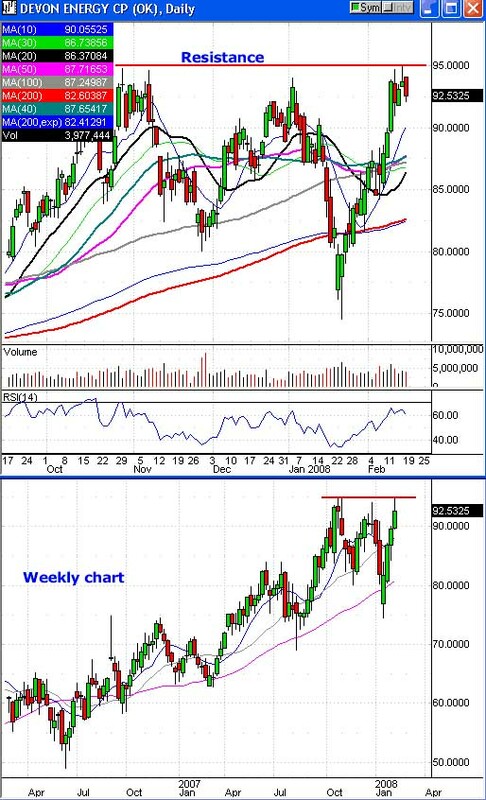 More conservative traders may want to consider a stop loss near the 50-dma around 87.60. A failed rally under 86 or a new decline under $82.40 could be used as a entry point for puts. Our target is the $76.00-75.00 range. 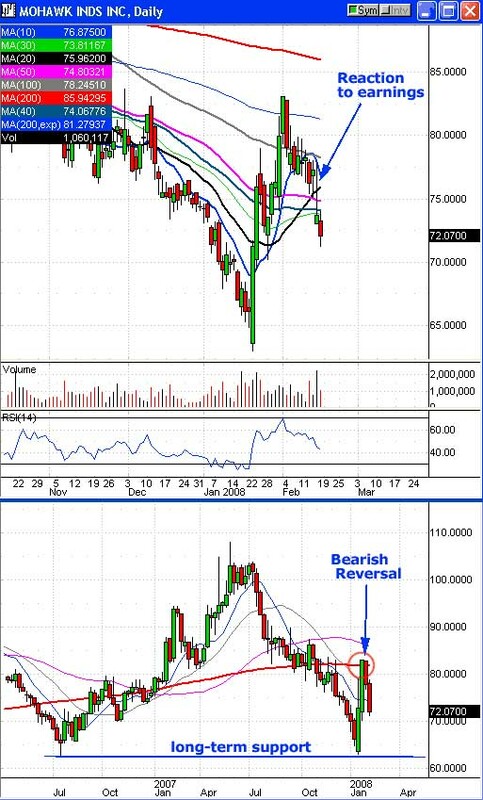 If SPG provides a new entry point we would suggest the March or April puts. A Goldman Sachs analyst downgraded the coal sector on Friday and the stocks got crushed. Shares of CNX deflated to close with a 6% loss. Unfortunately, the intraday low was $72.96, which was enough to hit our stop loss at $73.85. This could have been a one-day fluke but we'll have to see. We can blame Goldman Sachs again! Positive comments from a Goldman Sachs analyst about HANS' quarter drove the stock to a 5.7% gain (can you say short covering?). 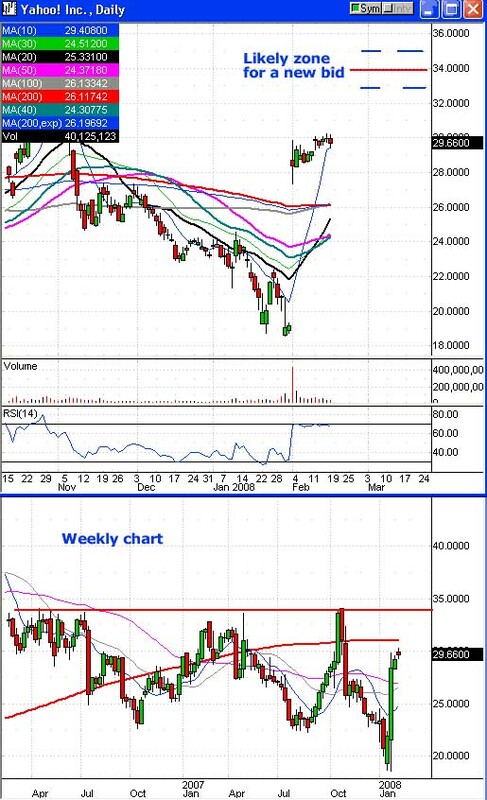 The stock soared Friday morning and quickly breached resistance at the $40.00 mark hitting our stop loss at $40.05. Hopefully when the stock gapped open higher and sprinted to $40 no one chose to open new put plays. Back on January 31st the DJIA looked poised for a big move - either a breakout from its bearish trend or a plunge back to its January lows. Instead the DJX merely tagged both the top and bottom edge of our strangle essentially going nowhere. In the past we have had success playing strangles on GOOG's always volatile post-earnings move. Yet the last couple of times this type of play has not worked as expected. We could have exited for a profit on the dip under $500 but the option values did not rise to where we thought it would (our target) price so we didn't. Wouldn't you like to know when a trending was about halfway completed? If you're lucky enough, a certain kind of gap will tell you just that. According to Thomas A. Meyers, writing in THE TECHNICAN ANALYSIS COURSE, measuring gaps are also known as runaway gaps or continuation gaps. They tend to occur about in the middle of a fast-moving up or downtrend. They illustrate strong momentum. Although strong volume is sometimes seen on a measuring gap, it's not a necessary confirmation. These gaps are not found as frequently as other types of gaps, such as the breakaway gaps studied in last week's article, but they're easily distinguishable. They come after a trend has been established rather than at the beginning of a trend. Like the breakaway gaps discussed last week, they may not be filled until the trend has completed and prices have reversed. That may be long after the gap was created. Meyers considers them reliable tools for measuring the probable targets of trends, but he offers a caution: they occur when prices have dropped about halfway through their eventual percentage drop, not halfway through the actual price drop. What does that mean? Let's look at the JNPR example. The peak at the left-hand side of the chart was at $27.29. The trough was at $12.60. From peak to trough, JNPR lost 53.8 percent of its value. Half of that peak-to-trough percentage loss occurred when JNPR had lost 26.9 percent of its value at the peak, so at $27.29 x 0.269 = $19.95. That does appear to be approximately halfway through the gap. In practical means, though, especially on long-term movements, Meyers says that to properly gauge the eventual target, you should be studying a semi-log chart and not an arithmetic one. If you're looking at an arithmetic chart and measuring vertical distances, Meyers cautions, you might misinterpret how much more of the move is yet to occur. If prices are in a downtrend, as JNPR was, the portion of the drop after the gap will be smaller than the portion of the drop before it on an arithmetic chart. In an uptrend, the opposite would be true. Let's look at that chart of JNPR again on a semi-log scale. In this particular case, the distance as measured on an arithmetic chart was actually a better measure of the vertical distance that JNPR would travel. In practice, it's probably best to keep in mind that a runaway or measuring gap tends to come about halfway through the percentage move, perhaps not relying too heavily on vertical measurements on either type of chart, as good as they might be for providing a quick estimate of where prices might go. Since runaway or measuring gaps tend to be rare but are often reliable measures, attention should be paid when one occurs. For example, we saw one produced on Citigroup's (C) chart in late October. This chart was snapped after the close on February 1, as this article was prepared. What was it suggesting then? If that gap was a runaway or measuring gap, it was suggesting that C had met and even exceeded the downside target suggested by that gap. 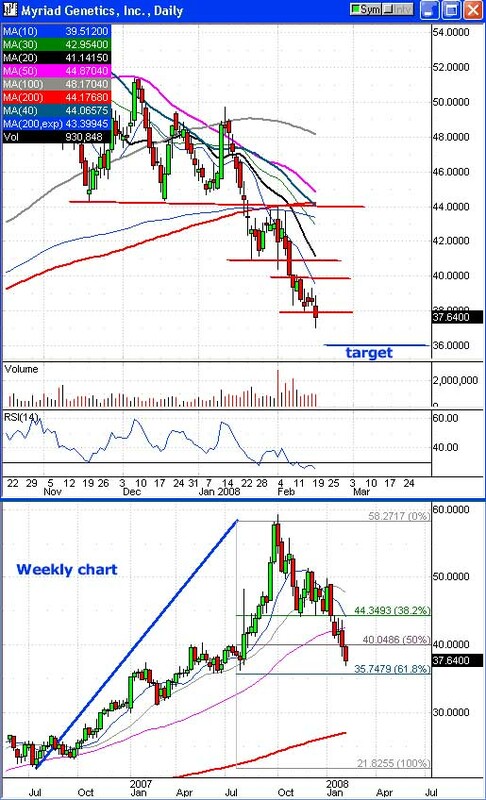 Traders who had measured vertical distances or calculated percentages would have been alerted to snug up their stops on bearish positions as C approached the zone from about $22.00-26.00 that C was approaching a possible downside target and bounce point. Does it mean that C's troubles are over and it's time to buy? Some certainly thought so and that may be true for the short or even intermediate term. However, this measuring gap signaled where the intermediate move might end only, not where the long-term one would. Care must still be exercised. Sometimes more than one runaway gap occurs in a strong trend. When that happens, the gaps tend to lose their measuring capacities, and subsequent gaps after the first runaway or measuring gap should always be suspected of being exhaustion gaps. Those types of gaps will be covered in the next article.